We, Samanta and Karl-Heinz and our entire team of travel consultants, scouts and tour guides are happy that you have found our pages. We are very connected with Perú. Not only that Samanta was born and grew up in Lima, it is the primal and original that can be seen in so many things and areas in Perú, if you keep your eyes open. Tours was born out of what we love to do when we have free time and spend a long time in Perú, because then we always travel in a double pack. We are happy to be your travel companions, who with a really rare and very special concept of the tours in Perú try to keep the most beautiful destinations ready for you and not only chase you from point to point in perpetual running, as we experienced and seen with larger travel companies themselves to have. The idea for this concept has evolved from our realization that we have realized that there are not enough flexible offers to make a good deal for individual travelers. That’s why we’ve specialized in developing special small travel components that we can then assemble for more comprehensive tours from two to 20 days. This gives us the opportunity to combine your overnight stays, visits and transfers so that you can experience the country from very close by. We pay particular attention to being in the thick of the action and not being driven to the sights of Perú, as with most major travel agencies, in a closed group away from the daily lives of the Peruvian people. Through our system of individual travel components, we can put together a program that more closely matches your interests and special preferences in the eventful tours in a special way. It is important for us to travel in a very personal and authentic way in a small and therefore very private setting. We can advise you individually and put together the right offer together with you. It is very important to us that your holiday becomes a unique and fascinating experience. We envision a memorable relationship with every action we do. 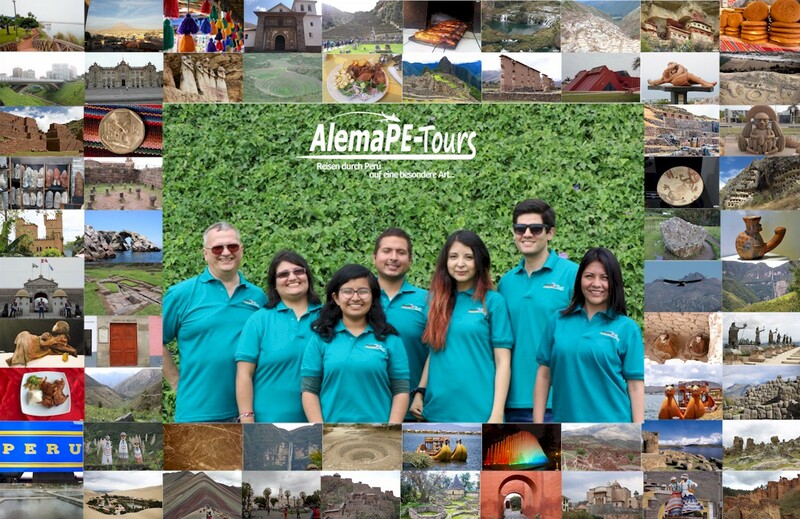 AlemaPE-Tours always strives to meet the evolving needs of our customers and partners, responding to them with the highest degree of excellence. We aim at simplifying and streamlining the concept of travel. With our unmatched service standards, we strive to live up to the expectations of our clients and thus provide the best and the most affordable holiday experience. We are committed towards establishing our brand identity with trust and honour in the minds of our customer with unmatched professionalism and service quality.